Ronaldo scored 66 goals in 56 matches in 2013 (Messi 91 goals in 2012) but didn't win important titles, Ribéry won 5 in 2013. Still Ronaldo, who certainly benefited from the extension of the voting period, has had a tremendous year and many regard him as the best player in his current form. Let's see which players scored best with the individual groups of voters. 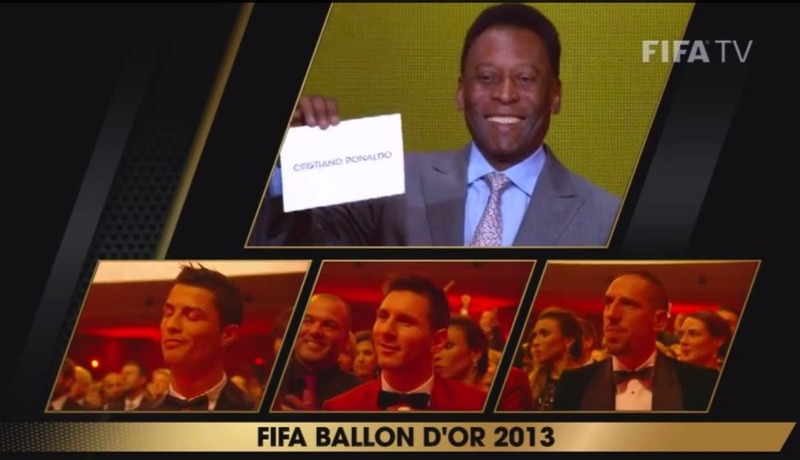 So Ribéry won media pretty clearly and Ronaldo won coaches and captains. Some tidbits from the voting behaviour of these 3 team captains, who all played on a top level in 2013. Be it as it is congratulations to Cristiano Ronaldo for winning the Ballon d'Or, to Lionel Messi for being the best dressed person at the ceremony and to Franck Ribéry for taking it like a champ! The network graph is interactive, you can click on nodes to highlight their connections or search nodes from the top menu. You can zoom in and out with the mouse wheel and move the graph by clicking and dragging the mouse. Players are colored in red, captains in a darker red brown tone, coaches in dark and media people in light blue. For voters in the graph (captains, coaches, media people) the vote breakdown is shown when the mouse is moved over the corresponding node. Published on January 13, 2014 (updated on May 14, 2018) by Ramiro Gómez (@yaph). To be informed of new posts, subscribe to the RSS feed. Tags: network graph, football, sigmajs, gephi, networkx, interactive.